UA Dean of Science and GSA President Joaquin Ruiz gave the Presidential Address last night in Denver as the Geological Society of America Annual Meeting got underway. He spoke on "From the Core of the Earth to the Top of the Mountains: A Renaissance in the Earth Sciences." Following that, medals and awards were presented, including the prestigious Arthur Day Medal to UA geologist George Gehrels (right). George will present one of the GSA Gold Medal Lectures later this morning. George Davis, also in UA Geosciences, was recognized for his Career Contributions Award from the Structure & Tectonics Division, which will be given Tuesday evening. Another UA geoscientist, Victor Baker gives the Quaternary Geology & Geomorphology Division Distinguished Career Award Lecture at 5 pm this evening. A gigawatt of new solar energy by year end? 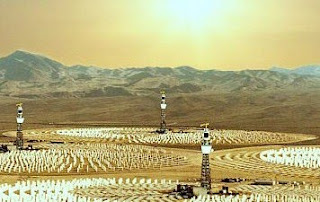 News from the just ended Solar Power International conference in Los Angeles, is that in 2010, "the U.S. solar electric market, including both photovoltaic (PV) and concentrating solar power (CSP) installations, could achieve a major milestone by surpassing 1 gigawatt of installed capacity in a year for the first time," according to Renewablesbiz.com. This would be a 114% increase over 2009's installations. The U.S. Solar Market Insight report says we could see 15 gigawatts installed per year by 2015. 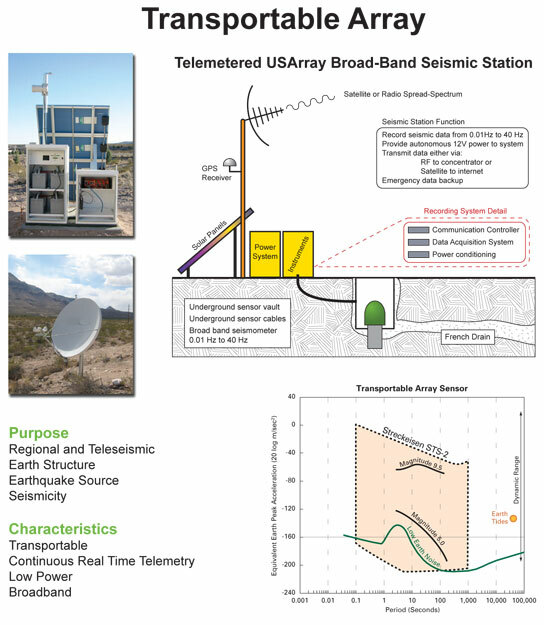 There's a good set of reference materials and resources on induced seismicity online at a DOE-supported Lawrence Berkeley Lab site - http://esd.lbl.gov/research/projects/induced_seismicity/ with a focus on Enhanced Geothermal Systems (EGS), carbon dioxide sequestration, and oil & gas production. The issue has been around for a long time but a provocative article in the New York Times last year about geothermal drilling in Switzerland causing small earthquakes prompted widespread fears that geothermal develop means potentially dangerous earthquakes and led to cancellation of projects in Europe and the U.S.
Blog Action Day: Is there enough water for both tomatoes and fish? It's billed as the longest bridge of its kind in the Western Hemisphere, took 8 years and $240 million to build, and will knock an hour off the trip across the Colorado River. It's an absolutely stunning engineering accomplishment and I believe U.S. Transportation Secretary Ray LaHood's prediction that it will become an iconic landmark just as has Hoover Dam. I've watched it grow over the past 5 years and been in awe every time I see it. For Arizona, the Hoover Dam bypass bridge will do something more than cut an hour off the drive from Phoenix to Las Vegas (note, there is no Interstate connecting two of the nation's largest and fastest growing cities). Kingman and surrounding areas are expecting a building boom as people move in to live in northwest Arizona and work in Las Vegas. Talk of hundreds of thousands of new homes around Kingman has faded in the past couple years as the nation's housing problems grew, but long term, the new bridge is a game changer. The houses will come sometime, and with them, demands for groundwater. Even Scientific American is getting into the hot topic of rare earth elements used in electronics and batteries, especially those used in 'green' technologies. A feature article posted online today notes that 97% of the world's production comes from China. And China recently instituted a non-embargo embargo of rare earth minerals to technology dependent Japan, further ratcheting world concerns about a global monopoly. 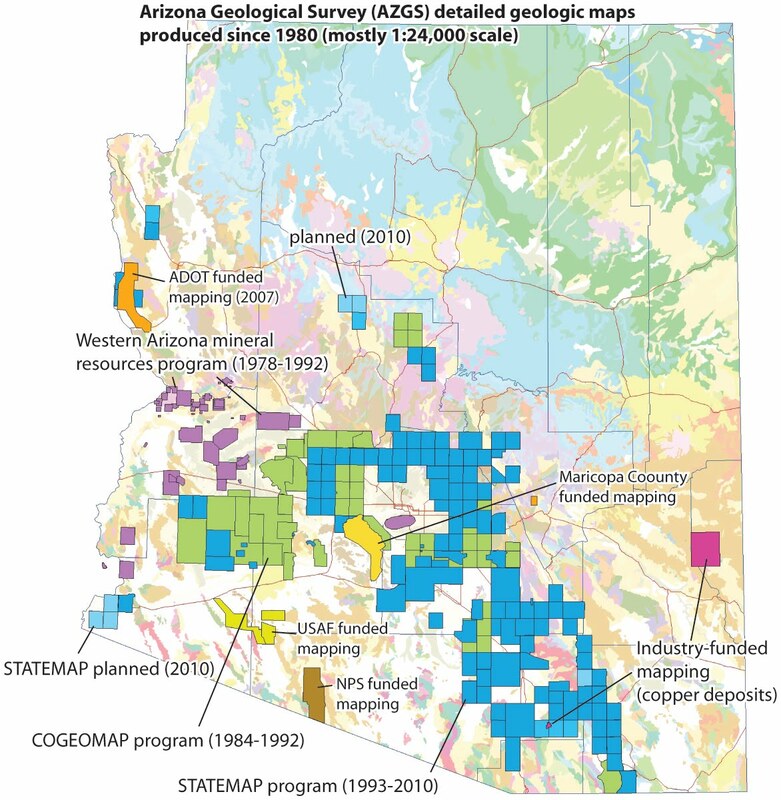 It'll be interesting to see if investors are buying into any rare earth opportunity or if they think industry has finally figured out how to make Arizona a producer. 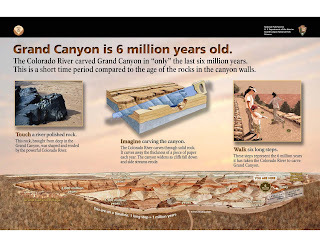 The National Park Service is unveiling the Trail of Time "interpretiv e walking timeline trail that focuses on Grand Canyon vistas and rocks to guide visitors to ponder, explore, and understand the magnitude of geologic time and the stories encoded by Grand Canyon rock layers and landscapes." There is a concurrent 3-day symposium on "New Appr oaches to Geoscience Education in the National Park System" that started yesterday and ties in with Earth Science Week nationwide. In addition to the actual scaled trail along the rim of the canyon, there are interpretive displays and web resources. I had planned on participating in all this but we have auditors in all week as a result of our large DOE geothermal data grant. Since we have one of the two largest awards and 45 subcontractors we are one of the first awards to be reviewed. You can guess where I'd rather be. Coal mining in West Virginia is coming to tv as a reality documentary show by the same folks who produce the popular "Deadliest Catch" and "Ice Road Truckers" series. Spike TV has ordered 10 one-hour long episodes of "Coal" to begin airing in April, 2011. Now we need someone to follow the hard rock mining industry, like we have in Arizona. There are a lot of stories to tell. Just look at how the rescue of the Chilean miners has become one of the most watched events on tv and the web ever. 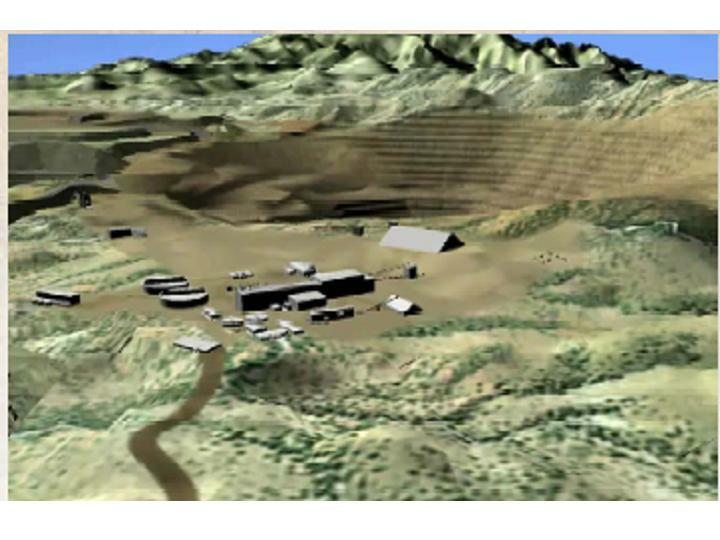 The Draft Environmental Impact Statement for the proposed Rosemont copper mine [right, artist concept of mine pit and operations. Credit, Rosemont Copper] now includes more than 20,000 scoping comments and about 150 technical reports that can all be viewed online at http://www.rosemonteis.us/. 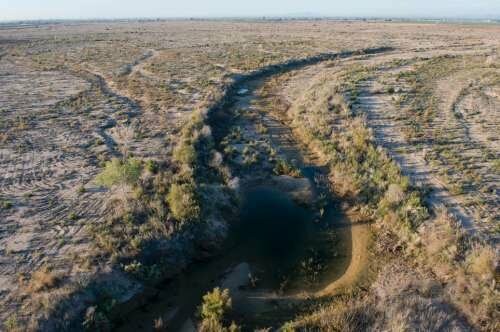 The sediment-laden flow occurred on Sept 21 in an unnamed drainage that enters Lake Roosevelt at the Orange Peel Rec Area turnoff at the north end of the lake. The sediment plugged the box culverts at Highway 188 and a fan filled the channel and flowed over the road 2+m thick [note Phil Pearthree for scale next to exposed flow. Photo credit Ann Youberg] . This area was burned by the 2005 Edge Complex. We wanted to see what kind of flow occurred, and where the sediment came from. Three to seven years after a wildfire is typically the period of lowest root strength, so we wanted to see if there were any landslides that contributed to the sediment input. The flow was not a flood flow, but we can't say with certainty whether it was a hyperconcentrated flow or a debris flow. The flow was composed of grus ranging in size from sand - med pebble. We did not observe any sorting or bedding, but there wasn't a large range in material sizes. We did see bedding in the older bank sediments, but not in the deposits of this flow. We also saw lots of chunks of bank that had fallen onto the flow but not incorporated into the flow, suggesting they were rafted. The channel was surprisingly steep - Phil's calculations ranged from 9-11%. In the upper watershed we saw lots of rilling and gullying on the hillslopes, but we did not see any evidence of mass movement. We assumed the rilling and gullying was post-fire but when I looked at the pre-fire 2005 NAIP imagery the hillslopes were rilled and gullied then too. It is just a very erodible landscape, which is probably why there was so much sediment available for transport. AZGS geologist is heading back to Havasu Canyon at the request of the Havasupai Tribe to finish up our assessment of last weeks floods. His preliminary report is being incorporated in the request for federal disaster declaration being prepared by the Tribe. Here are a few photos shot last week of the damage in the campground. The photo at upper center is looking down vertically into the mud-filled pool below Mooney Falls. There were no reports of injuries. Note the tent washed into the trees in the upper right photo. The Tribe hopes to re-open to tourists in a month. Interesting analysis on Mineweb.com today suggesting that the market is treating gold as if its price has peaked but copper will continue to rise. Emily Schaller is a Hubble Postdoctoral Fellow at the University of Arizona where she uses "NASA’s Infrared Telescope Facility (IRTF) on Mauna Kea in Hawaii to monitor methane clouds on Titan, where bizarre weather patterns could explain the extraordinary lakes, streams, and channels observed on Saturn’s largest moon." This blog lays at 1,351,085 in Alexa Site Rank (which puts us 5th among the top 25 blogs in the ranking), according to analysis by BlogRank. A colleague passed along a link to the ranking site, with references to the top 25 blogs based on their 20 metrics. Arizona Geology is #1 in number of pages posted (5,937 - what I lack in quality, I make up for with volume) and #1 in number of pages indexed by Google (2,350). 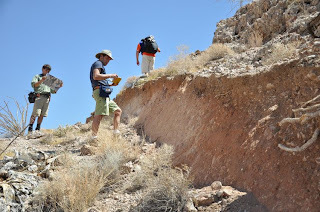 Overall, Arizona Geology gets an "ultimate rank" of 16th among geology blogs. 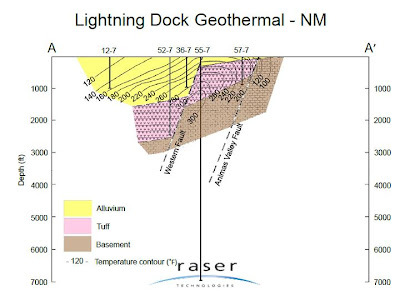 Raser Technologies says they have sold a 51% interest in Lightning Dock Geothermal Project in Animas County, New Mexico for $15.3 million. According to the announcement, "Raser has a 20-year Power Purchase Agreement (PPA) with Salt River Project to sell renewable energy from the Lightning Dock Project into Phoenix, Arizona. 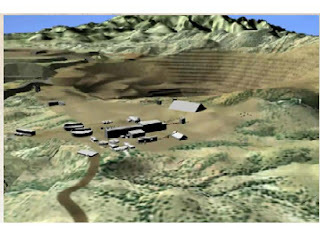 When complete, the proposed project is expected to deliver up to 15 MW of geothermal power." Copper price soaring but what about China? Copper prices hit their highest price in 27 months this week, with a December closing at $3.7745 per pound. Analysts say the price is within 6.6% of the metals all time high. Barclay's price target for Phoenix-based Freeport McMoRan is now at $130, up from their previous estimate of $120. The stock closed this week at $95.51. 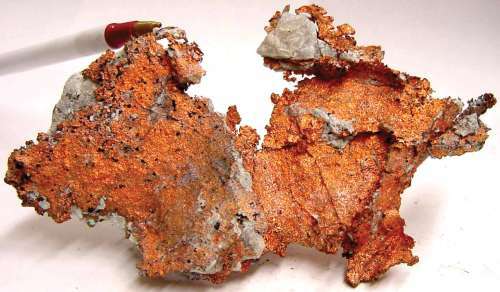 But the Financial Times reports that China's State Reserves Bureau, "the official body in charge of the country’s strategic commodities reserves," bought up an estimated 2% of global annual production of copper last year when it was much cheaper. So, if they cash in to take a projected profit of $1.5 billion they could either stabilize or perhaps drop copper prices. But it sounds like analysts expect that China will hold on to the stockpile and use it to meet rising national demand. A UA-led planetary research team found amino acids and nucleotide bases – the most important ingredients of life on Earth - when simulating possible chemical processes in the atmosphere of Titan, Saturn's largest moon. UA grad student Sarah Horst [right, credit UA] presented the results on Thursday at the annual meeting of the Planetary Science Division of the American Astronomical Society in Pasadena, Calif. 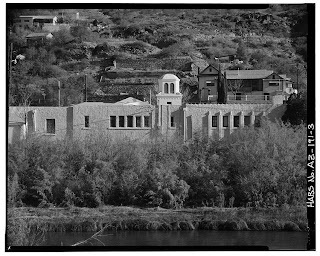 In 1540, Francisco Vasquez de Coronado and his men reportedly bathed in what is now known as Clifton Mineral Hot Springs. 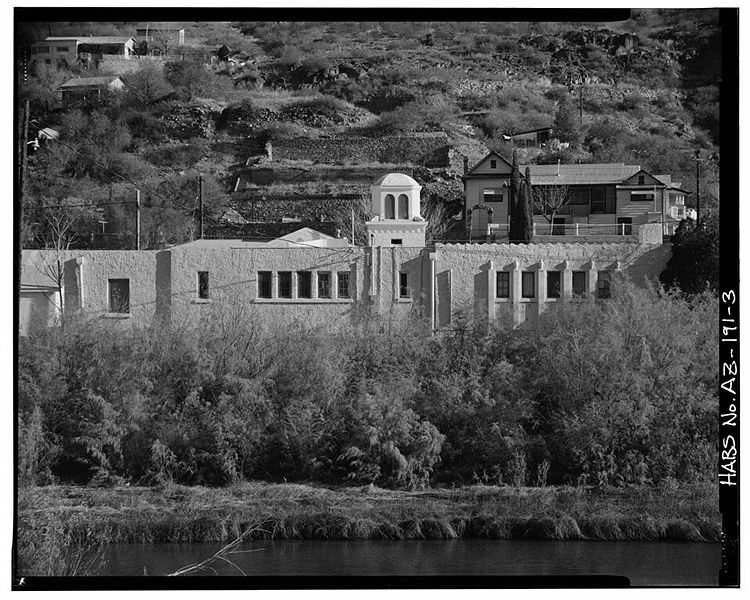 But despite repeated attempts to turn the mineral springs into resort spas, the area's economic basis is copper mining. Writer Lane Rogers offers these tidbits and others, including early mountain man fur trappers finding their way to the hot springs two centuries ago, in a short piece published this week by the Arizona Capitol Times. 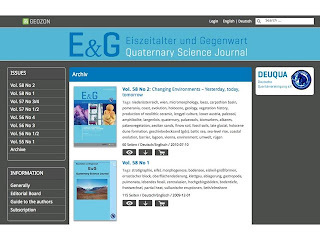 The publishers of the Quaternary Science Journal announced that all issues from 1951 up to 2010 have been digitized and converted to PDF-files for free viewing and downloading online. 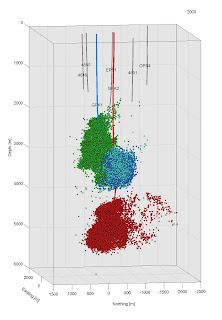 These are completely open access available on www.quaternary-science.net. "The digital archive includes 60 issues with more than 800 articles to all areas of the quaternary science like geology, paleoecology, soil science, geomorphology, geochronology, archaeology and geography etc. published by the German Quaternary Association. The languages of the articles are German or English and in some cases French." 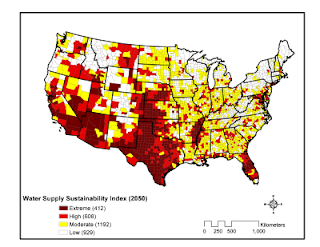 A study funded by the Natural Resources Defense Council concludes that "Climate change will impact water supplies, exacerbating existing pressures on water resources caused by population and economic growth" putting most of Arizona in their extreme water supply vulnerability category [right, credit NRDC]. Meanwhile, federal officials reported in August that Lake Mead is at risk of dropping below the 1,075 foot elevation which would trigger an agreement by the 7 states with claims to Colorado River water according to the New York Times, with reduction in water deliveries to Arizona and Nevada. However, water managers could send more water from Lake Powell downstream to Lake Mead to avoid the cuts. 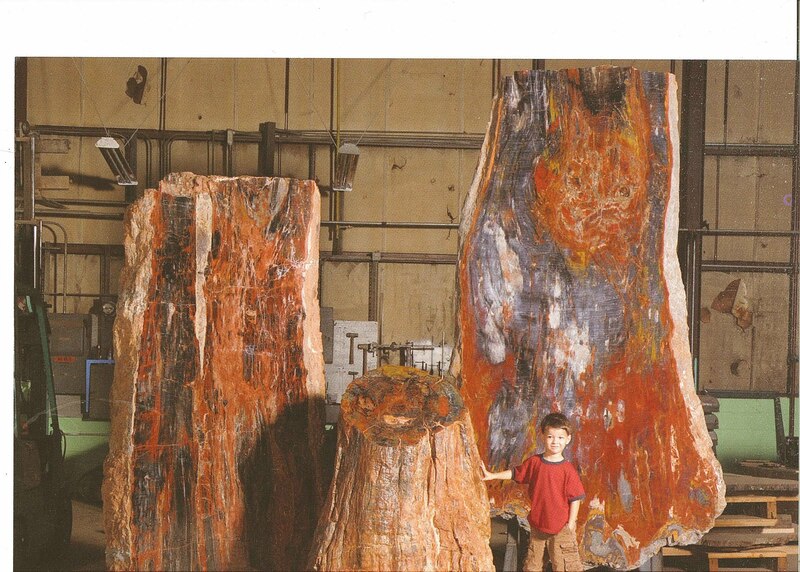 One of the more striking vendors at the annual Tucson Gem & Mineral Showcase is the one from Russell-Zuhl with spectacular slabs of Arizona petrified wood turned into tables and other furniture. Ralph Thompson with the company just forwarded some photos of petrified wood they have for sale. Here is one of the set he sent. The AZGS Geologic Mapping Advisory Committee met in Phoenix recently to set priorities for our geologic mapping program a year from now. Areas recommended for new mapping were decided by vote as follows: Artillery – Date Creek Mountains area (13 points), Prescott area (8 points), and Safford area (8 points). The Kingman area was ranked fourth (6 points). Joe Dixon, AZ State Land Dept. Grand Staircase is "last great unexplored dinosaur boneyard"
"Grand Staircase-Escalante National Monument is now one of the country's last great, largely unexplored dinosaur boneyards," according to Scott Sampson from the University of Utah and the Utah Museum of Natural History. 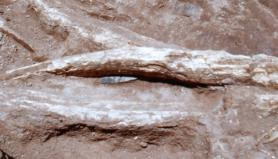 two remarkable new species of horned dinosaurs have been found in Grand Staircase-Escalante National Monument, just north of the Arizona-Utah state line. The giant plant-eaters were inhabitants of the "lost continent" of Laramidia, formed when a shallow sea flooded the central region of North America, isolating the eastern and western portions of the continent for millions of years during the Late Cretaceous Period. 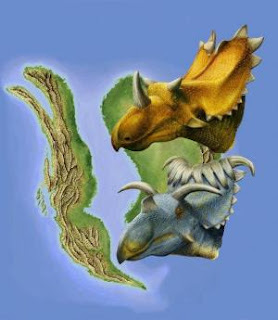 The newly discovered dinosaurs, close relatives of the famous Triceratops, were announced in PLoS ONE, the online open-access journal produced by the Public Library of Science. So, I have to ask whether the adjacent areas in Arizona might contain similar paleontological riches. ASU announced that Steve Squyres [right, credit NASA], the principal investigator for the science payload on NASA's Mars Exploration Rover mission, received the 2010 Eugene Shoemaker Memorial Award today at Arizona State University. The award, presented by ASU's BEYOND Center for Fundamental Concepts in Science, is given annually to a leading scientist in honor of his or her life and work. It is named for Shoemaker, who is known for pioneering research with his wife, Carolyn, in the field of asteroid and comet impacts. As part of the honor of receiving the award, Steve delivered the annual Shoemaker Memorial Lecture. 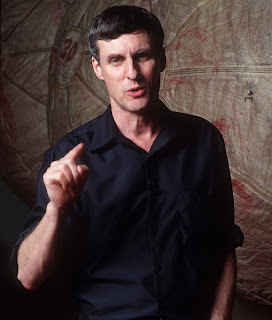 The title of his talk is "Roving Mars: Spirit, Opportunity and the Exploration of the Red Planet." I first got to know Steve when we were both PhD students (him at Cornell, me at Brown) working on the Voyager I data on Jupiter's moon Ganymede. We are among the co-authors on one of the early papers (The Tectonics of Ganymede, Nature, v295, #5847, p290-293) on those results. Steve Richard, Chief of the AZGS Geoinformatics Section, was elected Chair of the Geoinformatics Division of the Geological Society of America. 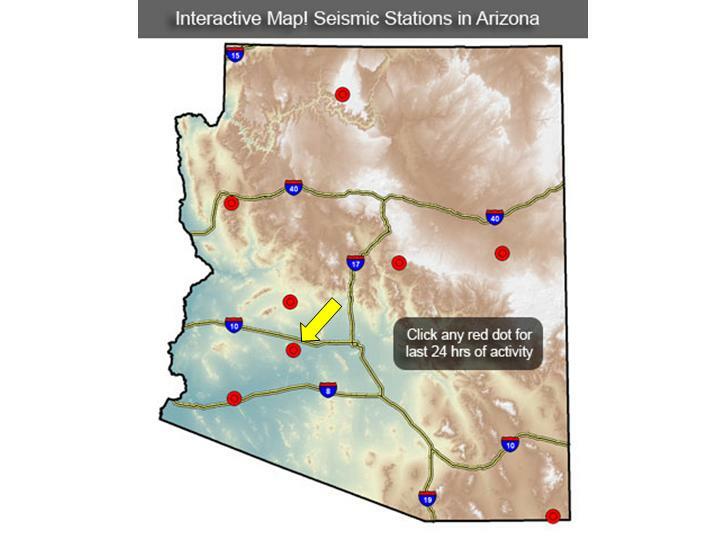 Steve is the chief architect of the AZGS-managed Geoscience Information Network (GIN) that serves as the data integration framework for the National Geothermal Data System and related projects. 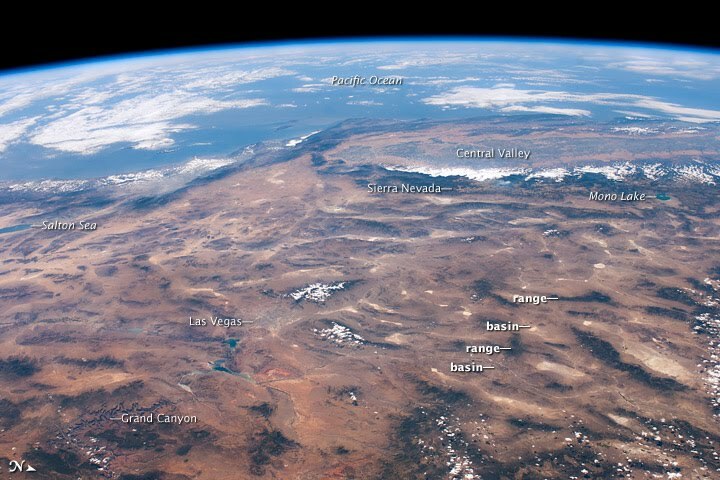 The Division is hosting a forum on a “Decadal Vision for Geoinformatics” on October 30 at the GSA Annual Meeting in Denver. Last week all of the above-ground equipment for our broadband digital seismic monitoring station in the Wintersburg area was stolen, including communications and power systems. Fortunately, the thieves did not break into the buried concrete chamber with the seismic sensor itself. The station is one of 8 we purchased from the EarthScope USArray experimental array [right] before they were re-deployed two years ago. They form the backbone of the state's integrated seismic network. We are assessing relocating the facility somewhere in the area that would be more secure. 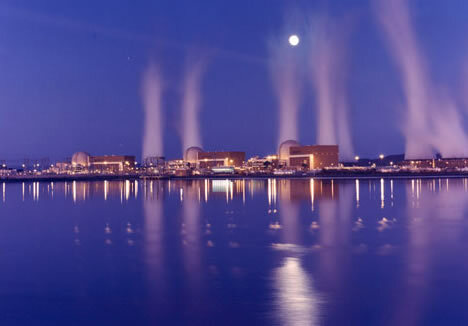 Currently there are 440 nuclear power reactors in operation and 59 under construction. There are 493 new nuclear reactors planned or proposed globally as of Aug '10, up from 435 Dec ‘09 (+13%). A total of 84 new reactors are scheduled to be commissioned by 2017. 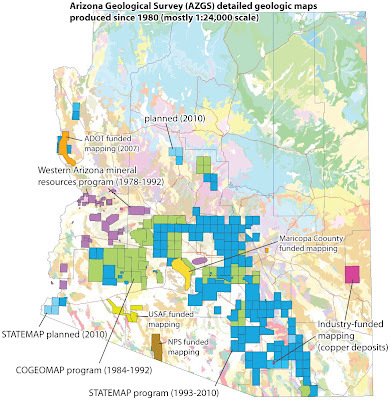 Bruce Heise with the Geologic Resources Division of the National Park Service passed along the news that they have completed Geologic Resources Inventories for two Arizona parks - Petrified Forest and Saguaro. The sets of GRI documents are linked from a table of reports done for scores of other parks. 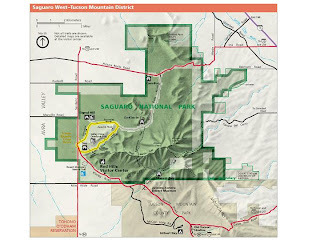 The reports include digital geologic maps and reports tailored to each park. The GRI report is written for resource managers to assist in resource management and science-based decision making, but may also be useful for interpretation. The report discusses potential geologic issues facing resource managers at the park, distinctive geologic features and processes present within the park, and the geologic history leading to the park’s present landscape. A map unit properties table summarizes the main features, characteristics, and potential management issues for all of the rock units on the geologic map. AZGS geologists Phil Pearthree and Joe Cook were reviewing their recent geologic mapping along the upper East Verde River north of Payson, with Rich Burtell from ADWR. A construction crew was clearing sediment from the highway where a flood had occurred on a small wash draining a recently burned area. While we were there, a trackhoe involved in the operation toppled off the downslope side of the highway,throwing the operator partially out of the cockpit and pinning him between the protective cage and some boulders. They immediately contacted 911, and the response was fairly rapid given that they were well out of town, but the operator was trapped for 30-45 min. He appeared to be near death when the emergency team decided they could risk moving the trackhoe. A large front-end loader was used to lift the trackhoe enough to extract him. By that time, there were probably 20+ emergency medical personnel and the Gila Co. Sheriff's Dept. was on the scene. They applied CPR and revived the operator, who eventually was taken out on a helicopter. Rich Burtell actually witnessed the accident and gave a statement to the sheriff deputy on the scene. Phil says a small newspaper article reports the victim survived but is still in critical condition. 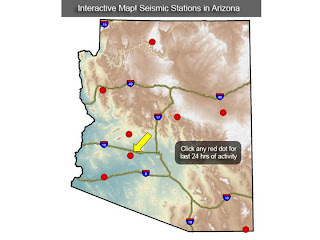 Previously unmapped earth fissures from the Sulphur Hills area near Willcox in Cochise County of southern Arizona were reported to AZGS last week. Geologist Mike Mahon has been in the field documenting them and shared these photos. The bottom one shows a well casing pushed above the surface presumably due to subsidence of the surrounding ground. Cochise County erected the warning sign where fissures intersect roads. The Havasupai Tribe declared an emergency late this morning following an automated flood warning on Cataract Canyon. 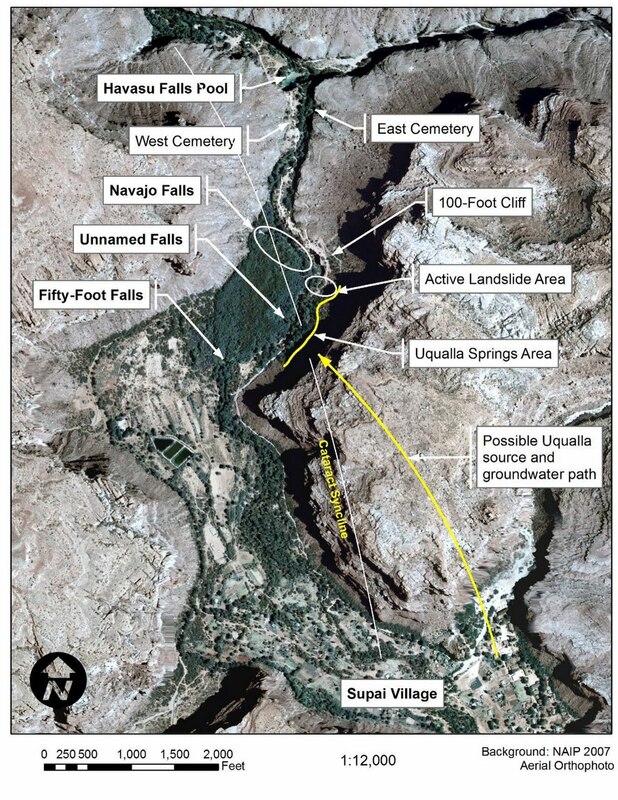 We have reports that a partial evacuation of Supai Village was underway in advance of the flood waters that should have hit around noon today. The Tribe yesterday posted an announcement on their web site and tweeted that the campground would be closed for at least a week due to flood damage from the past few days. The Tribe reported evacuating 150 tourists on Sunday afternoon due to flooding through the campground. Brian Gootee with the AZGS Phoenix office is in contact with tribal officials and plans on getting into the canyon tomorrow to help assess restoration and mitigation needs. 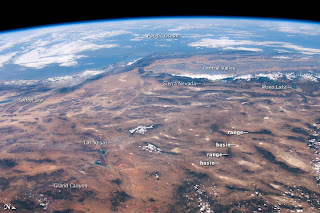 In an article in the current issue of Current Anthropology uses radiocarbon dates, geomorphological and archeological evidence to conclude that "an extraterrestrial impact is an unnecessary solution for an archaeological problem that does not exist." 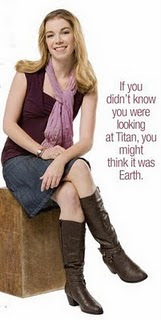 A spate of recent studies have disproved evidence of the impact itself. FEMA has revoked accreditation for 23 levees in Yuma County, Arizona as part of a nationwide reassessment of the flood prevention features, according to a story in USA Today. This means that affected homeowners will have to buy flood insurance. Another 260 or so levees in California were also de-accredited. 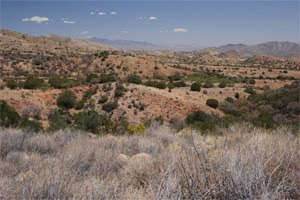 In August, a team of geologists from CICESE (Centro de Investigación Científica y de Educación Superior de Ensenada), USGS, Caltech (California Institute of Technology) and other organizations spent five days mapping and measuring the fault. Much of this was done by flying teams in by helicopter and dropping them off along the main scarp. Water and emergency supplies were also brought in since it was hot -- 115 F (46 C) by mid afternoon. 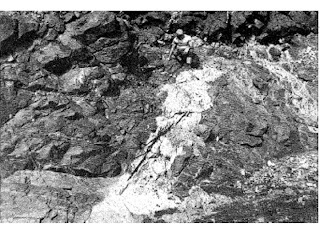 In this picture, the main scarp is seen along with three geologists. Here the scarp is about five feet (1.5 m ) high, dramatically attesting to the amount of energy it took to shift that much rock along many miles. Further from the epicenter, the scarps grew smaller, in some places being only 1 in (2.5 cm) in height. Photo taken on August 10, 2010. The worst flooding in a century hit the canyon in August 2008, which resulted in hundreds of camper racing to high ground in the darkness, buried the campground with many feet of sediments, and caused the creek to shift its course to the other side of the canyon. The Tribe is still dealing with the impacts of that dramatic event. The change of the creek bed may be partly contributing to the recent smaller floods affecting the campground and trails. A new article in Geology, includes co-authors Bill Dickinson and George Gehrels at the Univ. 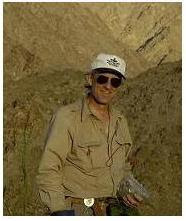 of Arizona and AZGS Senior Geologist Jon Spencer. Lead author is Steven Davis from Carnegie Inst. There's a stack of blog topics on my to-write list almost as long as the emails stacked up in my in-box. I've been on the road most of the past couple weeks - Washington DC with the State Geologists for 25+ meetings with federal agencies, Congressional committees, and NGOs; from there to Denver as a co-organizer of a 2-day NSF-sponsored workshop on building a National Geoinformatics Community, followed by a side trip to our family cabin in Wyoming (25 miles to the nearest cell phone access) before zipping over to Boise for the formal review of Phase 1 of the National Geothermal Data System project. A lovely 1100 mile drive home got us to Tucson just as the monsoon dropped the temperature 25 degrees at one degree per minute. 1200 emails but only 6 phone messages waiting for me, so if I haven't gotten back to you, give me a couple days to catch up. There are follow up actions from this flurry of activity that need to be pursued as well. Got through the mail tonight and paid the bills, so I should get back to blogging. Thanks to everyone who has passed along news and links.